Frankly speaking, GoDaddy has never been among our favorite website builders. Too clumsy and blatantly salesly, it didn’t inspire confidence. But things have changed a bit since our latest review. As of today, the website builder improved a lot, having completely rebuilt their platform. It is now also known as GoCentral, but the update has not been limited by the name change only. The website builder has introduced the advanced feature set and it now practices a brand new approach to the web building process. Are you intrigued to see what the service has to offer now? Let’s have a look at its updated feature set. GoDaddy website builder now allows creating websites with little or no programming skills at all. If you’ve ever worked with drag-and-drop platforms, then you know how convenient and user-friendly they are. 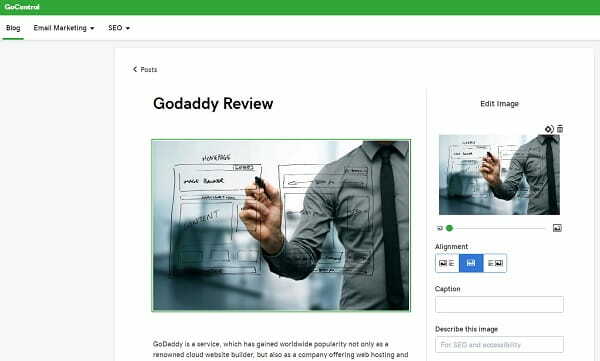 GoDaddy also comes with a drag-and-drop editor and creates a mobile-friendly environment to let users focus on their web design aspirations instead of dealing with web development challenges. GoDaddy has simple and intuitive interface, although, the homepage of the system is somewhat oversaturated with sections, links and blocks. It’s not easy to find the website builder, the hosting section, access to marketing tools and customer support section etc. As you access the website builder, though, everything becomes more understandable. The dashboard of the service features simple navigation as all the steps of the web design process are displayed on the right panel. The WYSIWYG editor immediately reflects the changes you make. This is very convenient for users, who work with the system for the first time. You get full control over the entire web building process. This is one of the reasons most users appreciate about the service. GoDaddy is a multifunctional website builder, which works well for creating different types of websites. The service is a nice solution for entrepreneurs willing to launch business websites. What you need is to provide your company info, select a logo, manage website settings and watch the way the changes are displayed on a screen. You can make use of such features as bookings, listings, online feedback forms and other elements you’d like to see at your business website. It’s also possible to view analytics here to see your website statistics. When it comes to creating personal websites like portfolios, for example, GoDaddy somewhat lacks behind its renowned niche competitors. The website builder has a nice gallery of stock photos and you can upload those of your own. However, image customization options are not quite extensive and there isn’t much you can do about that. Portfolio websites require more customization options to showcase your creative talent. At the same time, it is possible to embed audio and video files from SoundCloud, YouTube or Vimeo. This will give your website better performance. GoDaddy has a nice blogging engine. Starting a blog with the system doesn’t take much time, effort or knowledge. This is quite simple and quick. It’s up to you to decide how and when to add and update posts, integrate media files and other elements to boost user engagement. Users have two sign up options here, including standard registration procedure and RSS feed sign up tool. The demerit of the system is that it currently doesn’t enable users to leave their comments under the posts. This means that, if you need a small blog that will serve an addition to your website, then GoDaddy will come up to this purpose. However, if you expect to launch a large full-scale blog section, then the system is not the best solution. Ability to connect your web store to social media accounts etc. GoDaddy social media integration options are somewhat limited. What you can do here is to integrate popular social media accounts and provide links to them to enable users to reach them when needed. If you wish, you can connect your Facebook store to your account, but social media integration options won’t go further than this. As of today, GoDaddy doesn’t allow embedding live social feeds or sharing your content in social channels. GoDaddy has a SEO Wizard, which makes it possible to adjust the most important settings for good SEO optimization. Thus, you can fill out meta tags for all website pages, set up redirects and perform other SEO-beneficial actions. Unlike lots of website builders, GoDaddy doesn’t have integrated statistics collection tools. It’s only possible to add Google Analytics here to keep track of all the visits, number of users, locations they come from and other important parameters. In this respect, the service doesn’t rank high. However, it is possible to use the HTML skills to add the tools to track website statistics. When it comes to marketing, through, the website builder will inquire about your targeting sources and objectives to make it possible for you to run targeted email marketing campaigns. You’ll be able to issue and distribute coupon codes to engage user attention and invite them to join the system. If you use a Free Trial or a Personal Plan to explore the system, you should know that your website won’t be connected to the SSL Certificate. It ensures maximum website and content protection from unauthorized access. To connect the Certificate, you’ll have to buy one of the higher plans the service offers. As to the backup option, GoDaddy offers the autosave feature, which will create backup versions of the website by default. This is very convenient, especially for users, who cannot boast rich web building experience and may simply forget to save the website during the web design process. This is also a beneficial feature for unpredictable situations like hacker attacks or website crashes. GoDaddy can boast a rich template collection. There are 305 of responsive themes here and their quality is on a decent level. The templates are designed by the system developers. They meet the contemporary niche requirements and trends and fall into 22 categories based on the niches they belong to. 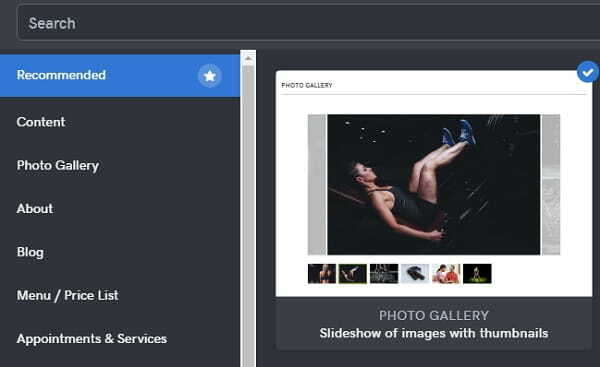 Whatever template you will select, there will be a preview option allowing you to see it in desktop and mobile modes. The search filter option will help you sort out the templates, simplifying the choice of the most suitable theme. Mind that you won’t be able to switch the theme, having selected it once. Otherwise, all the submitted content will be lost. As to the design customization options, they are not quite extensive as well. All web page sections have pre-designed look. The only thing you can do here to modify the project is to add and customize new sections, change fonts, replace stock photos with those of your own, integrate media files etc. The templates are ad-free. There is only a small footnote you can remove, if needed. The website builder doesn’t have multi language support. GoDaddy support is available online and on the phone. There is also the FAQ section and the live chat here, which can provide users with all the answers they may get during the web design process. The live chat quickly reacts to user inquiries, but it is available on weekdays only. If you need 24/7 customer support, you’re welcome to get in touch with the team by telephone. Email support is not available in the service. Apart from this, you can browse the Community or the Knowledge base of the service to view multiple intro videos guiding you through the stages of the web design process. GoDaddy has moderate pricing policy. It has a free one-month trial, which offers enough time to test the entire feature set of the system. At the end of the trial, you’ll have to decide on the plan you will further go for. The plans differ with regard to the terms, features and tools offered (disk space, templates, bandwidth, design customization etc.). There are four of them here, namely Personal, Business, Business Plus and Online Store Plans. The cost of subscriptions specified in the chart does not include the price of the domain name. By the way, it’s recommended to get annual subscription. Otherwise, monthly costs will be somewhat higher. Just like any other website builder, GoDaddy comes with a list of advantages and disadvantages each user should be aware of when choosing the system. Ease of Use. The website builder has a logically-structured WYSIWYG editor and drag-and-drop functionality to ensure maximum convenience and simplicity. Mobile-Optimized Templates. The themes adapt well to all mobile and desktop screens. Moderate Pricing Policy. The cost of the plans meets the quality of services offered. eCommerce option. 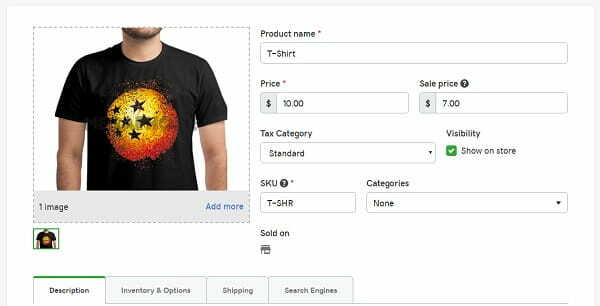 It’s possible to build a small-to-medium online store with the system. Lack of Blogging Functionality. You won’t be able to build a powerful and large blog here, while small blogs don’t look full-featured as well. Limited Design Customization. Templates are predesigned and it’s impossible to change their structure, even if you can do that. As a result, websites look a bit similar. No App Market. The website builder doesn’t have an app market, which could offer multiple widgets and templates for enhanced website performance and visual appeal. GoDaddy is a pretty nice website builder, which covers a broad spectrum of web design needs and allows completing multiple tasks. The service works well for the development of business websites, small-to-medium online stores and landing pages. It is quite intuitive and understandable even for users, who lack web design experience. The website builder has a decent collection of responsive templates, which fall into numerous categories users may choose from. The platform has a nice eCommerce engine while its blogging options leave much to be desired. GoDaddy also deserves the attention as a renowned hosting and domain name provider, even though, these options are not offered by default. All in all, the website builder is a nice choice for users, who don’t have long-lasting goals and serious web design aspirations. Test it first to decide, whether it comes up to your needs.